Absolute Remodeling web site selected as best contractor / remodeler site! As reported in Building Products, a glossy trade magazine published by Hanley-Wood, the leading publishers in construction magazines. 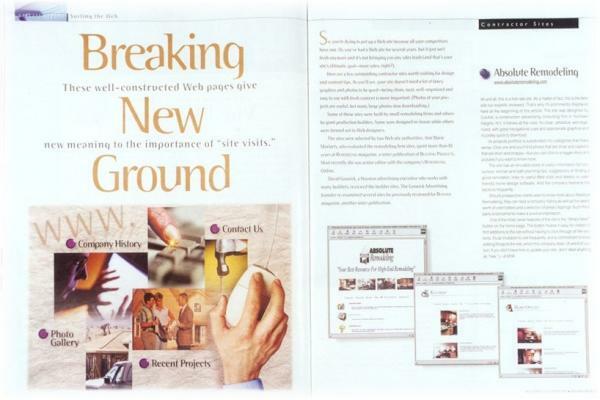 This article is in the November/December 1998 issue dedicated on the Internet, entitled "Breaking New Grounds." Two Web site authorities, Ann Marie Moriarty, REMODELING magazine [also a Hanley-Wood publication], and David Goswick, a Houston advertising executive who works with many builders. Some of these sites were built by small remodeling firms and others by giant production builders. Some were designed in-house while others were farmed out to Web designers. The sites were selected by two Web site authorities. Ann Marie Moriarty, who evaluated the remodeling firm sites, spent more than 10 years at REMODELING magazine, a sister publication if BUILDING PRODUCTS. Most recently she was senior editor with the companys REMODELING ONLINE. David Goswick, a Houston advertising executive who works with many builders, reviewed the builder sites. The Goswick Advertising founder re-examined several sites he previously reviewed for BUILDER magazine, another sister publication. All and all, this is a first-rate site. As a matter of fact, this is the best site our experts reviewed. Thats why its prominently displayed here at the beginning of this article. The site was designed by ConAd, a construction advertising consulting firm in Yorktown Heights N.Y. It follows the rules: Its clean, attractive, well-organized, with good navigational cues and appropriate graphics and its pretty quick to download. Its projects portfolio is subdivided into categories that make sense. Click one and youll find photos that are small and captions that are short and snappybut you can click to a bigger story and pictures if you want to know more. The site has an enviable store of useful information for consumers: kitchen and bath planning tips, suggestions on finding a good remodeler, links to useful Web sites and details on user-friendly home-design software. And the company freshens the sections frequently. Should prospective clients want to know about Absolute Remodeling, they can read a company history as well as five years worth a client letters and a selection of press clippings. Such third party endorsements make a positive impression. One of the most clever features of this site is the "Whats New?" button on the home page. The button makes it easy for visitors to find additions to the site without having to click through all the sections. Its an invitation to visit frequently, and a commitment to keep adding things to the site, which this company does. (A word of caution: If you dont have time to update your site, dont label anything as "new.")A.M.M. The reviews are in! Read what the "Real Critics" are saying about this web site!! !